1uA Maximum Shutdown Supply Current. 3.2V to 6.5V Input Voltage Range. Current-Limit / Short Circuit Protection. Thermal Shutdown Protection under Over Current Condition. Under Voltage Lockout Ensures that Switch is off at Start Up. Soft Start prevents large Inrush Current. No Reverse Current when Power off. Enable Active-High or Active-Low Version. The AIC6163 is integrated 85mOhm high-side power switch for self-powered and bus-powered Universal Serial Bus (USB) applications. 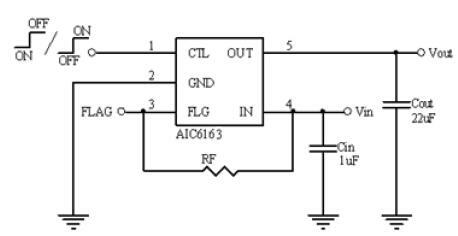 This switch operates with input ranging from 3.2V to 6.5V, making it ideal for 5V system. The protection includes current limiting with foldback, short circuit and thermal shutdown.The AIC6163 is ideal for any system where current limiting and power control are desired. The AIC6163 has low quiescent current and small package, which is particularly suitable in battery powered portable application. Guaranteed minimum output rise time limits inrush current during hot plug-in as well as minimizing EMI and prevents the voltage at upstream port from dropping excessively.